Sepsis is a disease which affects over 44,000 people a year, and that’s just in the UK alone. The disease, which is a type of blood poisoning that reduces blood flow to vital body parts like the brain, heart and kidneys among others, may be a rarity, but the impact that it can have on people’s lives has the potential to be completely devastating. One such case, that of Tom Ray who, then aged 38, developed the disease and had to have several parts of his body amputated if he was to survive, is the subject of a powerful little British film called Starfish, which doesn’t shy away from the brutal consequences of the disease’s impact on not just the individual, but also his entire family. Tom Riley portrays him as a loving family man with supportive wife Nicola (Joanne Froggatt) and a beautiful young daughter Grace (Ellie Copping), with another baby on the way. However, one night he suddenly develops a fever – initially blamed on a pair of expired sausages – which quickly develops into something that renders his arms, legs, and part of his face completely useless. Nicola reluctantly signs the form that allows all his affected areas to be amputated, and Tom is left as half the man he once was, a revelation that threatens to drive a wedge into his family’s happiness. This is where the film places its main focus, more so on the impact that Tom’s disease has on him, his wife, and his children. Part of his arc in the film is to accept that he is not the only person suffering from the consequences, even though he is the one that is permanently scarred, and what the film does that’s unexpectedly powerful is to not portray him as the helpless and pitiful soul whose life has been unwillingly changed forever. As he struggles with doing normal things like drink from a glass or even walking to and from the shops, he increasingly becomes bitter and verbally abusive to those who are only trying to help him. It’s clear that writer-director Bill Clark is not trying to paint him here as some kind of martyr or saint-like figure, but more like someone normal who has just had this life-altering disease thrown at him and is seriously angry about having his simple life taken away from him. It would have been extremely easy to make him an eternally likable figure, especially since the real Tom Ray and his family were heavily involved in the making of this film, but Clark mostly refuses to conform to a traditional storytelling method here, and presents a version of events that, while certainly altered slightly for dramatic purposes, still feels grounded in reality and without being entirely sugar-coated for an audience to easily swallow down. For that, Clark and his collective cast and crew should be respected. It also benefits from having two central powerhouse performers in the lead roles. Though Riley undoubtedly has the larger physical challenge with the heavy make-up on his face and simulated prosthetics on his arms and legs, and by all accounts he is effective in the part, it is Froggatt who probably excels more from an emotional standpoint. Nicola Ray, as portrayed in this film, is shown to be a hardworking woman who, when her husband is suddenly struck with the illness, is forced to handle everything from the bills to looking after her two young children almost singlehandedly. It’s very clear that the weight of the situation is becoming more unbearable to handle with every passing development, coming to a head in a climactic break-down scene where Froggatt gives her all and makes it feel uncomfortably real. It’s scenes like this where the film becomes appropriately difficult to handle, in the sense that it’s portrayed so emotionally and without lionising the fictional portrayals of these real people, that you’re on the verge of a break-down yourself. It could be seen as being perhaps a bit manipulative, but there is a well-meaning reason behind all of it and it’s thankfully not cornily executed, so it is somewhat forgivable that the film is making you feel all these emotions in the first place. The story of Tom Ray is already an inspiring tale of survival for anyone who is suffering from, or knows anyone who is suffering from, sepsis and its many difficulties, and Starfish should get that inspiring story to new audiences with competence and an admirable refusal to sugar-coat any of its harsh realities. 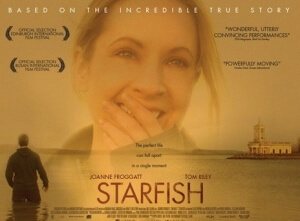 Starfish tells the inspiring true story of Tom Ray and his battle with sepsis with admirable courage, refusing to conform to a sappier version of events by not lionising its central characters, with strong emotional performances to make it a harrowing but quietly powerful story to tell on the big screen.